I actually had some inspiration and was able to crank out another layer. I used stamps for the next layer. The Sacral Chakra is focused on relationships and creativity I found it fitting to use my hand in hand stamp. Also, I used the flower because I'm such in my chakra and I want it to flower, bloom. 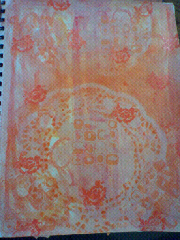 I also used a bubble/circle stamp in a light orange color. I'm very pleased how the next layer has expanded. 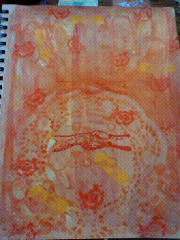 I plan to use words, phrases for the next later, but I have to let the layer of stamp ink dry. Finished page and canvas still to come. May creativity touch and inspire you today.